After trying out countless mattresses we have come with a list with best ones of different price categories. Read full review now! Tuft & Needle Queen is extremely comfortable medium firmness mattress that’s pretty soft yet supportive enough. The mattress consists of two layers that are made from high-density and high-quality polyurethane foam that doesn’t contain any harmful chemicals, carcinogens, PBDEs, heavy metals, phthalates or formaldehyde. The bottom support layer is 7-inch thick that keeps your spine and neck properly aligned, the top layer is 3 inches thick adaptive foam that provides pressure relief and support that prevents you from sinking (like with regular memory foam mattresses). Tuft & Needle Queen mattress isn’t memory foam so it bounces back when you apply pressure. The sleep quality and comfort of this mattress is impressive, the compromise between softness and firmness seems to be just right. The top layer of the Tuft & Needle Queen mattress contain cooling gel and graphite to cool you down while you sleep so you can sleep in comfort and won’t wake up sweaty. You can literally feel the heat being pulled away from you skin when you touch the mattress. The overall built quality seems to be pretty good, the mattress is made from high quality materials and it has sturdy feel to it. Tuft & Needle Queen mattress comes tightly packaged and manufacturer suggests to give it 72 hours for it to properly expand. When you first unpack the mattress there is a bit of a funny smell but it dissipates pretty quickly – unlike many mattresses where the smell stays for days or even weeks. 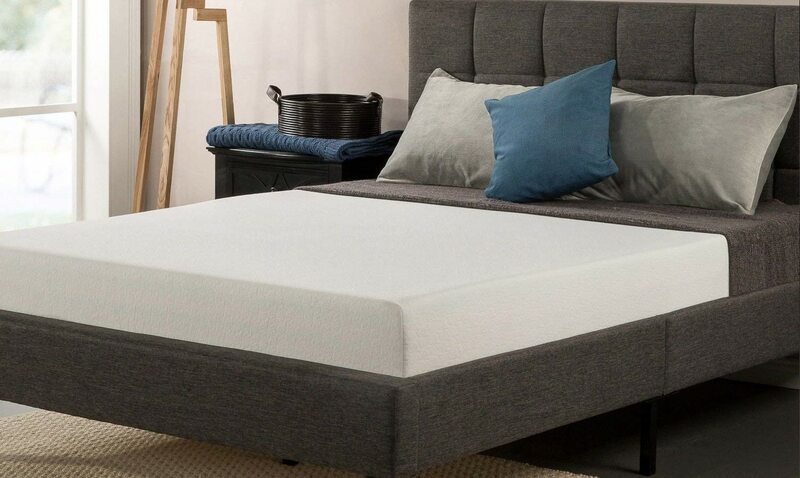 Tuft & Needle Queen mattress is very comfortable – more comfortable than most mattresses that cost thousands of dollars and provides wonderful sleep quality, that’s why it’s the best mattress of 2019! Zinus Ultima Comfort is insanely comfortable mattress, which is especially impressive considering how inexpensive it is. It retains its shape and firmness very well after months of use and doesn’t have any soft spots in the middle or edges. The mattress doesn’t trap body heat and doesn’t get too warm, you won’t be waking up sweaty. Zinus Ultima Comfort doesn’t sink in and if you sleep together with someone you won’t be disturbed when the other party gets out of the bed, it’s pretty firm but still manages to be extremely comfortable. When you first get Zinus Ultima Comfort mattress out of packaging it has to expand – it takes about 10 minutes but I suggest to give it 24 hours for proper inflation if possible. Another thing I have to mention is that the mattress feels a bit funny at first but it doesn’t take long for the smell to fade. How good can a mattress that costs less than 100 US dollars be? As it turns out – surprisingly good. LINENSPA 8-Inch mattress is very comfortable. It’s medium firmness – the upper layer of the mattress is 1.5 inch soft memory foam that minimizes pressure points and makes the mattress soft and comfortable, while the bottom layer consists of encased 6-inch coil springs that provides support and distributes body weight. It also creates some bounciness and increases the breathability of the mattress which can be felt because it doesn’t hold heat like other memory foam mattresses – which prevents you from sweating while sleeping and improves overall sleep quality. The coil springs doesn’t make any noises like squeezing. Laying down on it feels like floating and is very relaxing. The fabric is of decent quality and the LINENSPA 8-Inch mattress feels durable enough to last a long time. LINENSPA 8-Inch mattress is shipped in relatively compact packaging – it’s compressed and rolled, it isn’t a problem to move it through shallow spaces like doorways. When it’s first unpacked it needs some time expand, the manufacturer says it can take up to 48 hours for it to fully decompress but in most cases it shouldn’t take longer than couple hours (TIP: it expands faster in warmer rooms). LINENSPA 8-Inch mattress has 10-year manufacturer defect U.S. warranty. LINENSPA 8-Inch mattress is surprisingly well made product for it’s price – it’s comfortable, creates high-quality impressions and offers amazing value for money, that’s why it’s the best cheap mattress under 100 USD of 2019!